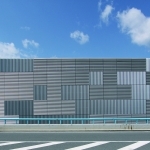 非常感谢 Takashi Yamaguchi & associates 予gooood分享以下内容。更多关于他们：Takashi Yamaguchi & associates on gooood. On the east of the site, the elevated road joint between Osaka and Kyoto where the JR Tokaido line is crossing from the west. It is to be seen a widely spreading switchyard on the same direction of the elevated road. The vicinity of the site is an eclectic gathering from small to medium size of factories, warehouses, trade facilities and housings forming which is the mixed landscape of architectural typologies. The client is a company holder who is running an experiment about the safety of medicine by planning and developing tools and equipment for medical purposes. The requested program was about the reconstruction of the factory by giving two different options. Firstly, the completion of the existing part of the building and then the construction of the whole part of the program and design was expected. 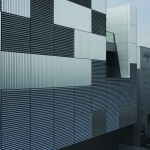 The building body is covered with a delicate membrane constituted of aluminum louvers in order to avoid showing the disgusting clustered pipes. Concerning the maintenance ease, the louver aperture ratio and the space behind those offer a proper access to the pipes system. The reconstruction was also an experimental way to reduce as much as possible the impact on the neighborhood of the intimidating volume of the uninteresting factory. To attain to this result, the louver’s angles, and horizontal or vertical directions are directed by randomized mathematical rules. The first floor is divided into conference room, reception, office, management office and warehouse. On the second and the third floors, there are gathering functional spaces like a production spaces as the fabrication department and development department which are vertically joined as a “rift” system that break the frontier between the two floors. The fourth floor was allotted to the one room with a large meeting space which can be responded to the office for design research and the development and various seminars and meetings. 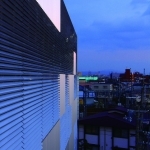 Some of the horizontally directed louvers are reflecting the moving clouds in the blue sky or the cars light crossing the street into the night. 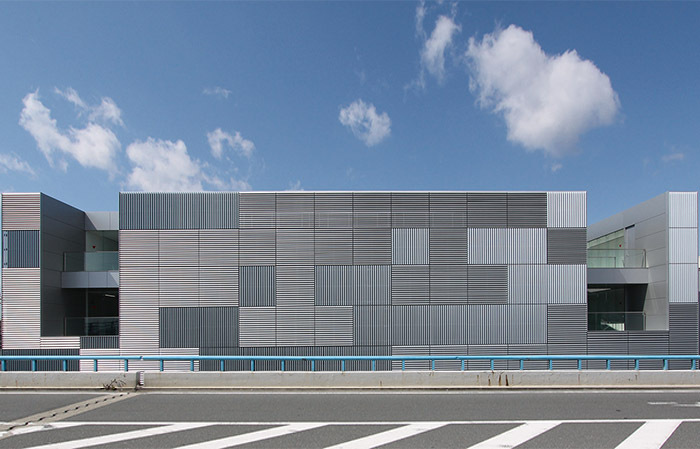 By moving the point of view, by looking at some of the vertically directed louvers, the segmented perception of the neighborhood’s image is changing. By reflecting the changing nature and vicinity scene of the building, this effect is fragmenting the building and his environment perception and this while preserving a form of human presence feeling. 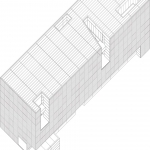 The same principle goes for the void “light court” linking the relaxation spaces on the third and fourth floors. By using the glass screen inserted into the verticals and horizontals openings, the image of the nature enters into the inside of the building. 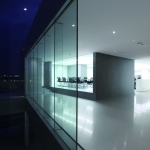 The glass screens take, transform and bring a sort of virtual image of the everyday life from the outside into the monotony filled inner space of the factory. 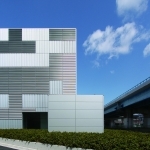 Clients: NAGANO SCIENCE CO., LTD.